By clicking on the blue portal below, you can download a PDF of the October 27 edition of the San Bernardino County Sentinel. Brian Johnson’s two-and-one-half year tenure as Upland police chief is at an end. The atmosphere surrounding his exodus is radically different from the air of confidence that attended his assumption of the leadership of the department in March 2015. Many in the Upland community hailed Johnson’s hiring at the time it occurred, characterizing him as a “cop’s cop,” whose career with the much larger, more prestigious, more sophisticated, more cosmopolitan and more storied Los Angeles Police Department would add dimensions to the smaller and parochial Upland PD. And Johnson appeared to have a genuine affinity and deep concern for the officers he commanded. On the evening of his introduction to the community at a March 2015 city council meeting that took place technically before he was officially police chief, a report of an injury to an officer came in and Johnson made a hurried departure into the field to ensure assistance was rendered, delaying only long enough to apologize for his abrupt leaving with a terse explanation of urgency. Upon assuming the post of police chief, Johnson initially earned kudos and appreciation from a cross section of residents and the business sector for stepping up patrols and the visibility of the department’s officers. Johnson, however, was the first Upland police chief who had not promoted from within the ranks since Eugene Mueller, who would later go on to become San Bernardino County sheriff, was persuaded to leave his position as a captain with the Pasadena Police Department to take on the position of top cop in Upland in 1941. Thus, Johnson was foreign to much of the culture and tradition within the Upland Police Department from the outset, and with the passage of time the degree to which he was out of step with the men and smaller complement of women he was commanding became more and more apparent. The recruitment drive that brought Johnson to Upland was launched in 2014 with the looming retirement of Jeff Mendenhall. After Mendenhall’s departure in December 2014, Captain Ken Bonson, a 30-year veteran, had assumed the position of acting police chief. Bonson had been in the running to accede to the position of chief, and remained as captain in the immediate aftermath of Johnson’s hiring. A year after he was passed over in favor of Johnson, Bonson retired. Bonson’s exit marked the beginning of a wave of departures of experienced and advanced officers during the second year of Johnson’s primacy with the department. That mass exodus intensified as his third year as chief started this spring. To date since Johnson became chief, 28 officers left the Upland Police Department. Seven of those involved personnel who were within or very near the standard age range for retirement among law enforcement officers. The loss of 21 other officers in that time frame falls far beyond the typical two-to-seven percent annual attrition a department normally experiences in terms of lateral transfers or promotions to higher positions in other departments. Perhaps the most noteworthy of those departures were the ones not voluntarily taken but imposed on captain Anthony Yoakum and sergeant Marc Simpson. Yoakum was a 29-year law enforcement veteran who at one point had risen to become Johnson’s second-in-command in charge of operations. Simpson was a 23-year member of the department who was the Upland Police Officer Management Association president. A key battleground for the heart and soul of the department was the cultural metamorphosis relating to marijuana. For nearly two decades, as in the majority of cities elsewhere in the state, the political establishment in Upland had resisted accepting the new ethos that had its rise with the passage of Proposition 215, or the Compassionate Use Act of 1996, which allowed marijuana to be used for medical purposes by those obtaining a prescription. Upland had maintained ordinances prohibiting the operation of dispensaries in the city and had spent a considerable amount of money over the years on enforcement efforts to keep ones that cropped up shuttered, as well as on legal fees against the more persistent medical marijuana purveyors who had the sophistication and the financial wherewithal to remove the issue to the courts. The city was stymied by two of those cannabis kingpins – Randy Welty and Aaron Sandusky, the operators, respectively, of the Captain Jacks and G3 Holistics dispensaries in Upland. Well before Johnson arrived in Upland as police chief, both Welty and Sandusky managed to keep their operations up and running while their medical marijuana business competitors in Upland consistently, after either short or medium term runs, would be closed down. At last, after consistently losing in their legal efforts against Sandusky, city officials made a breakthrough when they succeeded in getting the federal government – in the form of the Drug Enforcement Agency, the FBI and the U.S. Attorney’s Office – to unleash their firepower on him. In 2012, Sandusky was prosecuted in Federal Court, convicted and given a ten-year prison sentence, which he is yet serving. It was against that backdrop that Johnson came into Upland. Relatively early on, he came to understand that three members of the city council as it was then composed – mayor Ray Musser, councilwoman Carol Timm and councilman Glenn Bozar – were intent on holding the line against marijuana liberalization. In an effort to please them, he angled to use the police department’s authority to help hold that line. In 2016, for example, when advocates of medical marijuana availability in Upland began circulating a petition to legalize marijuana sales in the city, Johnson detailed the department’s detective bureau to monitor the signature gatherers and give them the third degree if the opportunity presented itself. Many of the officers felt such an approach bordered on or actually crossed the line into interfering in the political process. At the same time that the pro-medical marijuana availability petitioners were active on the doorsteps of Upland homes and in the parking lots of local shopping centers, a statewide initiative – Proposition 64 – aimed at legalizing marijuana for recreational purposes had been put on the ballot. Ultimately, Proposition 64 would be approved by California voters. Simultaneous with Proposition 64’s success statewide, it had failed with voters in Upland that November. Johnson took that as a signal to continue with the department’s efforts to shutter the dispensaries that continuously sprouted at new locations within the city. For many of Upland’s officers, including ones who earlier in their careers had enthusiastically involved themselves in enforcement of the penal code relating to the prohibition of marijuana, an element of the absurd had crept into the perpetuation of the die-hard effort to eradicate marijuana clinics in the face of a two-decade old law that allowed marijuana use for medical purposes and the more recent passage of Proposition 64, which essentially ended, at least in California, marijuana’s run as an illegal narcotic and transformed it into a legally and socially acceptable intoxicant on the order of beer and wine. To them, the department’s policy was tantamount to swimming against the tide of history. And in an age of austerity with the drop off in revenue coming into government in general and budgetary and staff cutbacks to the police department, a growing number of officers felt it was time to put the department’s limited resources to work on other areas relating to crime in the city rather than chasing after the coming generation of cannabis entrepreneurs, whose numbers would eventually be winnowed and profits diminished through the principal of onerous competition among themselves. Johnson, however, did not quite see it that way. One of the duties that had been entrusted to the department shortly before his arrival was responsibility over the city’s code enforcement function. He had taken the community’s pulse and it was clear a majority of Uplanders wanted their city to remain off limits to the marijuana profiteers. He saw that as authorization to double down on the marijuana clinic eradication effort. It would be one such undertaking, which Johnson somewhat inexplicably sought to carry out on his own, that ultimately, hindsight now reveals, was the catalyst for the series of events over the next nine months that led to his resignation as police chief. On January 18, 2017 officers, with Johnson monitoring the operation, served a warrant at a dispensary at 1600 W. 9th Street. All marijuana, cash, weighing devices, display shelves, equipment and office supplies on the premises were confiscated. The following day, however, the dispensary was back in operation. Another warrant was obtained and the plan was to serve it either on January 25 or 26, the following Monday or Tuesday, when manpower was available. Impatient with that delay, Johnson on January 21, 2017 went to the dispensary unassisted and without notifying any of the officers on duty or dispatch of his intentions, detained everyone inside at gunpoint and ordered them to the ground. He then called the department, requesting assistance. Johnson was unable, however, to give his correct location and was only able to say he was at 9th and Benson. He could not leave the inside of the dispensary, as the dispensary’s entry and exit were controlled, as is common with commercial cannabis operations, by an electronic locking door manually controlled by an armed security guard. When the first responding officer, Anthony Kabayan, arrived on the scene, he was not able to gain entry into the business. Kabayan then initiated an effort to kick the door down. Ultimately, Johnson was able to have the door opened, allowing the arriving officers into the business. Johnson had at least six people – customers and employees of the dispensary – detained, handcuffed, transported to the Upland Police Department headquarters and put into holding cells and then transported to the West Valley Detention Center where the county’s jailers initially resisted booking them because they had not been arrested on a bookable offense. Ultimately, Johnson was able to convince the sheriff’s employees to accept the prisoners into the detention center on a municipal code violation, which technically could not be used to justify the incarceration and which ultimately the district attorney’s office declined to prosecute. This has left the city subject to a potential false arrest lawsuit from at least six of those individuals. Subsequently, in an apparent effort to get the city out from underneath the liability of those yet-to-be-filed civil suits, Johnson began to cast about for some justification of the arrest that could be applied after the fact. He attempted to do this roughly a month after the arrests by requisitioning the laptop computer and DVR seized from the dispensary that were part of the surveillance system of the premises. He then ordered the department’s information technology specialist to make copies of the video contents and computer data. That, however, constituted an illegal search under the Fourth Amendment and a violation of SB 178, a 2016 California law governing the search of electronic items. A separate search warrant was required to search those items and could not have been obtained because the original crime was a misdemeanor and not a felony. For several of the department’s officers, Johnson’s action on January 21 and its aftermath was what one of those officers described as “the last straw,” in that Johnson’s actions violated officer safety protocol, did not take into account that since he was not easily identifiable as a police officer that the on-site security guard could have thought that the business was being robbed, thus resulting in an armed confrontation, and that he placed the officers responding to the location and citizens at danger. With the three highest ranking department members below Johnson who were involved in the response to the dispensary – a patrol sergeant, the watch commander and the patrol division commander – concurring, a collective decision involving multiple officers was made to proceed with an official complaint against Johnson. That complaint, in slightly different format, was lodged by at least three department members in early February. Detective Lon Teague, the president of the Upland Police Officers Association, played a central role in taking the issue forward, ultimately to Upland’s acting city manager, Martin Thouvenell. Thouvenell was himself a former Upland police chief, and was one if the three panelists that evaluated the applicants to replace Mendenhall in late 2014 and early 2015, which ultimately selected Johnson. Upon learning that Teague had gone out of department channels in lodging the complaint – channels that would have ultimately reached Johnson and have required that he pass judgment on his own action – Johnson suspended Teague, pending an internal investigation. At that point, captain Yoakum, then the department’s second ranking officer behind Johnson as the operations commander, and Simpson, the department’s senior sergeant and the president of the Upland Police Management Association, moved to back Teague. As both Yoakum and Simpson were considered members of the department’s management team, Johnson deemed their action to be insubordination. They too were suspended. In the meantime, Thouvenell, at an expense to the city of $30,000, had a management consultant look into the complaint against Johnson. That inquiry was completed by late May. Johnson at that point remained police chief, with what was essentially full autonomy over the department. For slightly more than six months, the investigation of Teague was ongoing, and the suspensions of Yoakum and Simpson continued. During that time, all three remained in limbo and on paid leave, representing a cost of roughly $270,000. Taken together with the $30,000 spent on the management consultant’s inquiry into Johnson’s action, the cost to Upland’s taxpayers growing out of the January 21 incident approximated $300,000 monetarily, and the loss of Yoakum’s, Simpson’s, and Teague’s services throughout the six-month plus duration. Ultimately, it was determined that while Teague’s action had deviated from the normal protocol and lines of authority within the department and had “improperly” challenged Johnson’s judgment and authority, his status as the department rank and file’s union authority would make firing him highly problematic. He was given a 40 hour suspension as his official discipline with a notation of reprimand by the chief placed into his personnel file. Even though Yoakum and Simpson outranked Teague, they were in an even more delicate situation. Indeed, as members of the department’s management team, they were answerable to the police chief and subject to his discretion. Both were charged with disparaging the chief of police and making unauthorized disclosures about the investigation. Given the nature of the chain of command and their direct links to Johnson, it was Johnson’s judgment that the working relationship he had with both of them was irrevocably sundered. On that basis, they were terminated earlier this month. Early Friday morning, Johnson announced to his command staff that Monday, October 30, will be his last official day on the books. Persistent efforts to contact Johnson this morning and early afternoon prior to press time reached only the recording device on his desk telephone and the day watch commander, who told the Sentinel he had attempted to relay the interview request to Johnson but had been unable to reach him by mid-afternoon. The legal fate of Bill Postmus, whose meteoric rise in San Bernardino County politics in the early 2000s was matched in intensity by the plunge that followed his implosion and crash to earth in a series of scandals that rocked the county and the Republican Party to the core, will not be fully determined at least until January. Postmus, 46, was in court early this morning before Judge Michael A. Smith for possible sentencing on charges against him which were lodged in 2009 and 2010 and to which he pleaded guilty in March 2011. His sentencing has been held in abeyance since then as part of the plea agreement he entered into in which he committed to cooperate with prosecutors in their prosecution of his alleged accomplices and co-conspirators. In the immediate aftermath of his guilty plea Postmus met the prosecutors’ expectations, testifying as the star witness before a grand jury in April 2011 which was looking into a $102 million settlement conferred upon the Colonies Partners in November 2006 and the exchange of money that took place between the Colonies Partners and county officials within the ensuing eight months. That $102 million payout ended legal wrangling between the Colonies Partners and the county which related to disputes the company had with the county flood control district over drainage issues at the Colonies at San Antonio residential and Colonies Crossroads commercial subdivisions in northeast Upland. Following Postmus’ testimony, which was augmented with the testimony of more than 30 others, that grand jury in May 2011 handed down an indictment of Colonies Partners co-managing principal Jeff Burum; Postmus’ former board of supervisors colleague Paul Biane; former San Bernardino County sheriff’s deputies union president Jim Erwin; and Mark Kirk, who had been the chief of staff to another of Postmus’ board colleagues, Gary Ovitt. According to the 29-count indictment, Burum had conspired with Erwin to threaten and blackmail Postmus and Biane into settling the lawsuit. The indictment alleged Erwin prepared but ultimately withheld “hit piece” mailers that targeted Postmus, who was then the board of supervisors chairman as well as the chairman of the San Bernardino County Republican Central Committee, and Biane, then the vice chairman of the board of supervisors as well as the vice chairman of the same central committee. Those mailers, according to prosecutors, took as their subject matter Postmus’ homosexuality and methamphetamine addiction and Biane’s financial travails which had him on the brink of bankruptcy. After Postmus, Biane and Ovitt on November 28, 2006 voted to enter into the $102 million settlement, the indictment alleged, between March 2007 and the end of June 2007, the Colonies Partners endowed political action committees controlled by Postmus, Biane, Erwin and Kirk with $100,000 each. Prosecutors maintained the donations to Postmus and Biane were bribes provided in return for their votes in support of the settlement and that the $100,000 donation to Kirk’s political action committee was likewise a bribe made in exchange for his having delivered Ovitt’s vote in favor of the settlement. Kirk as his chief of staff, had been Ovitt’s primary political advisor. Postmus’ vote in favor of the settlement had come when he was a lame duck as a member of the board of supervisors. Three weeks previously, on November 7, 2006, he had been elected county assessor. In 2007, after he assumed the position of assessor, he upped the number of assistant county assessors from one to two and installed both Erwin and a close friend and political associate, 23-year-old Adam Aleman, into those positions. In the ensuing 18 months, Postmus slipped further into the morass of drug addiction. The county assessor’s office, into the management echelon of which Postmus had made a series of no fewer than 11 political appointments of friends and associates who had virtually no real estate, appraising or taxation policy/regulation expertise, became a hotbed of partisan political activity, promoting the Republican Party, Republican causes and certain Republican candidates. An investigation into this activity by the district attorney’s office began in 2007, and in 2008 events overtook Aleman, who was called before a grand jury to be questioned about the goings-on in the assessor’s office. Panicked, Aleman had an office employee alter some internal assessor’s office documents, destroyed the hard drive in a county-issued laptop and then lied in his testimony to the grand jury. Ultimately, all of these actions were detected by district attorney’s office investigators and Aleman was arrested and charged with a variety of crimes in July 2008. By November 2008, he had begun cooperating with prosecutors, including recording conversations with others, among them Postmus, helping at first to assemble a case against members of the assessor’s office engaged in political activity on county time using county facilities that was unrelated to the assessor’s official function. Subsequently, he provided information to district attorney’s office investigators with regard to events prior to and after the $102 million settlement of the litigation brought by the Colonies Partners against the county, which he said involved efforts to intimidate, threaten, and blackmail Postmus and Biane to extort from them support of the lawsuit settlement, followed by the provision of kickbacks after the settlement, disguised in the form of political donations. Aleman pleaded guilty to four felony charges in July 2009 and agreed to testify against any others involved in illegal activity about which he had knowledge. Based in large measure on information supplied by Aleman, the district attorney’s office in 2009 charged Postmus with misuse of his authority as assessor in allowing the office to be used for unauthorized purposes and with misappropriation of public funds. In February 2010, again based to a considerable degree on information provided by Aleman, the district attorney’s office in conjunction with the California Attorney General’s Office charged both Postmus and Erwin with conspiracy, fraud, involvement in an extortion and bribery scheme, misappropriation of public funds, engaging in a conflict of interest as public officials, tax evasion and perjury related to the Colonies Partners lawsuit settlement and its aftermath. Postmus, who had been driven to resigning as assessor in February 2009 in the wake of public revelations about his drug use, by early 2011 was running out of options and money. At that point, he entered into the aforementioned plea arrangement on the assessor’s office corruption case, the Colonies Partners lawsuit settlement case and a separate charge relating to drug possession, a total of 14 felonies and a single misdemeanor. Since 2011, Postmus has been a free man despite his conviction, though the resolution of his criminal case yet hung over his head, and the adverse publicity had ruined any prospect that he might remain in politics. His guilty plea on the conflict of interest charge legally prohibits him from holding elective office. In January, the criminal case against Burum, Biane, Erwin and Kirk went to trial after numerous motions, rulings, appeals and delays. A total of 39 witnesses were heard from during the course of the case. The lion’s share of those testified during January, February, March and April, setting the table for Postmus and Aleman, who were the star witnesses, to begin their testimony in May. During his first three days of testimony under direct examination from May 1 through May 3, Postmus replicated the key elements of the prosecution narrative. In the latter half of 2006, Erwin, working on behalf of Burum and the Colonies Partners, Postmus testified, had threatened to expose elements of both his and Biane’s personal lives in an effort to persuade them to support the settlement. And Burum had promised to support him in either or both future political and business endeavors once the settlement was out of the way, he said. Moreover, Postmus said, he believed the $102 million paid out to the Colonies Partners was ridiculously more than the development company was due. The threats and promises of reward, he testified, along with the desire to put the whole thing behind him prompted the settlement. And after the settlement was in place, Postmus testified, the Colonies Partners had come through with $100,000 for him in the form of two separate $50,000 donations to political action committees he had control over. But thereafter, the defense was given an opportunity to cross examine Postmus and controvert the prosecution’s version of events he had supported. Particularly under the withering questioning of Burum’s attorney Jennifer Keller, Postmus began to go sideways, responding positively to the suggestions in Keller’s questioning which offered alternate and even diametrically conflicting descriptions of events he had described. On the witness stand, Postmus moved toward adopting Keller’s stated theory that much of what he was testifying to had been planted in his memory by unscrupulous district attorney’s office investigators who had taken advantage of him, his legal vulnerability and his drug-addled state by interrogating him over and over while inculcating in him the prosecution’s narrative of events with their questions. Contradicting his testimony under direct examination, Postmus said he did not consider the $100,000 in contributions to his political action committees from Colonies Partners in 2007 to have been bribes, and that there was no quid pro quo inherent in his settlement vote and the contributions. He claimed any confusion about what had occurred was because “my mind is kind of messed up” from his use of drugs. Ramos’ statement presaged what occurred this morning, when instead of acquiescing to having Judge Smith adhere to the language of the plea agreement which called for dismissing eleven of the felony charges against Postmus and taking into consideration Postmus’ testimony to arrive at a determination as to what his sentence would be, Supervising San Bernardino County Deputy District Attorney Lewis Cope asked for Smith to refer Postmus’ case file to the Riverside County Probation Department for review and sentencing recommendations. The matter is going to the Riverside County Probation Department because Postmus, who was formerly one of the most powerful political figures in San Bernardino County, oversaw and approved budgetary allotments for the San Bernardino County Probation Department, and officials want to avoid any chance of the recommendation on sentencing being influenced by that. Based on these developments, and Ramos’ statement at the conclusion of the trial, it appears that the district attorney’s office is seeking to have convictions on all of the charges against him reinstated. Under that plea agreement, Postmus was convicted of all 15 of the charges on the proviso that based upon his cooperation, all but three of the 14 felony convictions would be vacated, and the maximum sentence he would receive would be six years and eight months, with the possibility that the prosecution would recommend that he be given straight probation with no actual prison time. Sentencing remains within the discretion of the judge. The judge in Postmus’ case, Michael Smith, was the trial judge in the case tried against Burum, Biane, Erwin and Kirk. Thus, Judge Smith has sufficient perspective to make his own conclusion as to Postmus’ credibility on the witness stand and whether he indeed lived up to the terms of the plea arrangement he made with prosecutors in 2011. The case file the Riverside County Probation Department will be provided on Postmus will consist either primarily or wholly of material generated or vetted by the San Bernardino County District Attorney’s Office, which is still smarting from the failure to win any convictions in the matter arising out of the Colonies Partners lawsuit settlement other than the pleas from Postmus. Judge Smith gave indication that he anticipated having to mete out Postmus’ punishment based on the prosecution’s contention that Postmus had failed to live up to the terms of the plea agreement and in the face of contrary contentions by Postmus’ lawyers, Stephen Levine, who is representing Postmus with regard to the Colonies Partners lawsuit settlement, and Richard Farquhar, who represents him with regard to the charges stemming from his tenure as assessor. “That [the sentencing recommendation] might be contested,” Smith said, with some degree of understatement. Judge Smith then said that the Riverside Probation Department should not count on him to assist it in giving his size-up of how truthful Postmus had been on the witness stand prior to sentencing. The probation department is to complete its report and Cope, Levine and Farquhar are to make written submissions, known as sentencing memorandums, to the court. Smith ordered Postmus to return to his courtroom on January 19, at which point sentencing is to take place or further hearings or arguments on the matter will be either heard or scheduled. After the hearing, Levine told the Sentinel, “Mr. Cope wants to throw him [Postmus] under the bus.” Levine said that he is uncertain as to how aggressive Cope, who saw firsthand the pressure Postmus was subjected to during Keller’s cross examination, will be in asserting Postmus failed to abide by the terms of his plea deal when he authors his sentencing memorandum. Levine, who characterized Cope as “a decent guy,” said nonetheless that Cope took his marching orders from district attorney Mike Ramos. Ramos is facing reelection next year and it is anticipated that his political opponents will make an issue of the failure to get a conviction in the recently concluded Colonies Partners lawsuit settlement case, as the matter has been widely referred to as one of the most important prosecutions carried out by Ramos’ office in his more than 14 years as district attorney. Jurors interviewed after the verdicts were returned indicated that Postmus’ hedging of his testimony was a factor in their acquittal votes, but they said that Aleman’s credibility was a major consideration as well. Aleman was subjected to an even more brutal onslaught during his cross examination by defense attorneys than was Postmus. Though he was shown to have gotten some particulars such as dates and locations of meetings that took place between himself and some of the defendants wrong, Aleman remained relatively faithful to the narrative staked out by prosecutors in the indictment, and on occasion grew contentious with the defense attorneys. This was in stark contrast with the manner in which Postmus appeared to come to an accommodation with the defense attorneys who were cross examining him. For that reason, it does not appear that the prosecution will move to revoke the terms of the plea agreement Aleman entered into in 2009. Other witnesses were problematic for the prosecution during the trial. Supervisor Josie Gonzales confused 2005 with 2006 in recounting a near encounter she said she had with Burum in China prior to the settlement vote, which she testified was part of a pattern of her being unduly pressured to approve the lawsuit settlement. Matt Brown, who had been Biane’s chief of staff during the run-up to the settlement in 2005 and 2006, had been counted upon by the prosecution to offer damning testimony during the trial, recapitulating elements of his grand jury testimony. Brown, who had created the political action committee through which the $100,000 donation from the Colonies Partners to Biane alleged to be a bribe had been provided after the settlement and who in 2009 and 2010 used a hidden recording device in an unsuccessful effort to capture utterances from Biane implicating himself in the alleged bribery scheme, proved highly testy during his questioning on the stand, claiming he had no recollection of numerous events nor of several of his previous statements before the grand jury. Prosecutors have no leverage on either Brown or Gonzales, however, as they were never charged with crimes. In the case of all of the witnesses, including Postmus, the passage of a decade between the events in question and their testimony is seen as a plausible reason for lapses in memory or confusion with regard to dates, times, places and facts. Postmus repeatedly claimed that his memory of events had been impaired by his drug use. Nevertheless, prosecutors believe Postmus in large measure malingered memory loss and that he has demonstrated remarkable clarity and mental acuity with regard to many other events and activities, both related and unrelated to the Colonies case. They believe internal inconsistencies in his testimony demonstrate he failed to meet the requirement laid out in his plea arrangement that he cooperate fully with the prosecution and testify accurately and to the best of his recollection at trial. Cope said he was not at liberty to comment on anything relating to Postmus’ case due to his office’s policy of not discussing ongoing cases outside the courtroom. Nan Songer, a self-taught naturalist, played a once well-hidden but pivotal role in the American victory in WWII. Nan Songer displays one of the creatures which fascinated her as a child and which became her life’s work and legacy. Born Nannie Mae McCawley on May 26, 1892 in Cooksville, Tennessee to Joey Harris and Sarah Lula Hix McCawley, she was frail as a child and led a sheltered life. While she was very young she became interested in insects and arachnids, observing them in her home’s garden, where she would sit for extended periods in the sun. In high school, she studied botany and biology under the tutelage of Marie M. Meislawn. Her brother Ridley had contracted tuberculosis and the family moved to Texas and Golden, Colorado in an effort to help with his recovery. After her family moved to Redlands, she was awarded an art scholarship to the University of Redlands in 1920, although she did not graduate from that institution. On November 23, 1923, she married William A. “Bill” Nelson, with whom she would have two children, Elizabeth Louise “Betty Lou” on March 10, 1924 and William Donald “Billie Don” on September 23, 1925. In 1926, she lost both of her parents to influenza. She and Bill divorced sometime around 1930. Nan subsequently met Noah H. “Bill” Songer, and they married on August 5, 1934. Songer was two decades older than she. He was devoted to her. They resided on the North Bench on a three acre ranch at Juniper and Adams, and had a mailing address of Route 1, Box 120 Yucaipa. 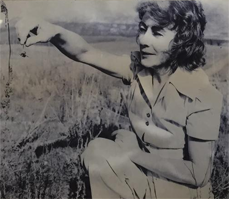 It was at that ranch in northwest Yucaipa that Nan was able to indulge her childhood passion to become an active naturalist. Black widows were her favorite. With World War II nearing, the U.S. military had a need for material to provide the 1/10,000th of an inch crosshairs in the bombsites of the Army Air Corps’, the Navy’s and the Marines’ planes. Someone at the U.S. Bureau of Standards had heard of Nan and her highly specialized operation. In short order it was determined that the spider webs that proliferated in abundance at Nan’s spider farm fit the bill for the markings needed in the highly classified bombsights that in time some 100,000 bombers and fighter aircraft would be outfitted with. 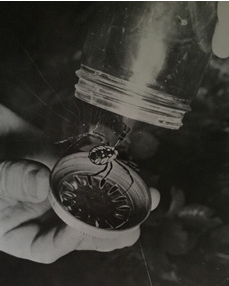 Nan’s unique talent to capture the tiny spider silk threads spun by her captive spiders at once became a highly prized military asset. Seemingly without missing a stroke, her farm was able to produce in mass an unlikely commodity – spider silk – that had become essential to the war effort. 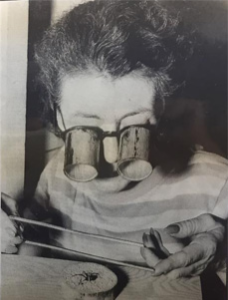 While the bombsights were highly classified and there was a degree of secrecy about them, by 1943, reporters with various newspapers all around the country were publishing stories about Nan Songer, who became known as the “Spider Woman.” The exact location of her spider farm was kept confidential, as between 1940 and 1946, the Songer Ranch’s address was omitted from the Yucaipa phone book. The final product: A Norden M-9B bombsight. Today, Yucaipa’s Mousley Museum preserves Nan Songer’s place in U.S. history. Copyright 2017 by Amanda Frye. All rights reserved. Photographs herein reproduced with permission. The Halloween madness begins over the weekend and is set to extend into the next week-and-a-half. The favorite color of the moment is standing out everywhere and its all-black. Let’s not forget, with the color come all the fashionable street witches. I’m going way back to the 1920s era, when Coco Chanel herself brought black back from the grave. From then on, no longer would the color be associated with death, but more with chic sophistication. It was the little black dress which started the celebration of a new black beginning. Black has always been the main pallet choice, the favorite color, for many people because it’s easy and you don’t get it as dirty, meaning it requires less diligence when it comes to washing. It’s also said to make a slimming effect on the fashionista. This weekend, why not reenact the little black dress with a witch’s hat and pointy black pumps? You can probably get this witchy outfit straight out of your closet. Since the costume scene is underway, start thinking of ways to get dressed in a variety of black, anything from a veil to funky skirts. Make it worth the stare, if even for a moment. Have fun snapping your photos or Facebooking live for Halloween.